On Monday, when not watching the eclipse, the market digested the departure of Steve Bannon from the White House. US indices were broadly flat, as was NKY, which tracked the yen during the cash hours. NKY volatility has been very low for three weeks now. DAX was down on a stronger Euro, however FTSE held its own against stronger GBP. The picture was much clearer in currencies, USD was down against all currencies and gold, and 10-year bond yields were down. Oil gave up nearly all the sharp ramp it enjoyed last Friday, as the final day of the September contract was traded. Sometimes Tuesday is the reverse of Monday and so it was for USD which was up against all currencies except CAD which fell after the Canadian Retail Sales miss at 1230, mainly because there was no negative news and Oil rallied. Gold was similarly down, and yields were up. The picture was similar with indices, which were all up sharply, and the VIX was back below 12. However for all indices except FTSE, these were the highs of the week. The sentiment see-saw took a downturn again on Wednesday, partly when Trump said he would build the wall even “if we have to close down our government”. PMIs during the European session were mixed, and then there was a big miss (-9.4% vs +0.3%) in the change in US New Home Sales at 1400. SPX and DAX gave up around half of Tuesday’s gains, NKY gave them all up on stronger JPY. Only FTSE kept its head above water on two days of weakening GBP. Currencies were mixed but, in line with indices, was generally negative for USD. EUR recovered all of Tuesday’s losses, as did JPY. The rise in AUD and CAD was more muted, helped by the rise in Oil despite a very slight EIA miss (-3.33M vs 3.45M) at 1430. This is one of the most accurate EIA prints versus estimate we have seen for a long time. In line with everything else, Gold was up and yields were well down, giving up two days’ gains. Thursday was yet another see-saw day. We separate our chart of the week into days at 0000GMT each day, partly because it is the global time reference, but mainly because it cuts a neat division between the Asian, European and US markets in that order and is close to the ‘twilight hour’ (2100-2200 GMT) when no markets are open. The USDJPY chart this week is quite amazing, precise reversal after the end of the US session on the first four days of this week. 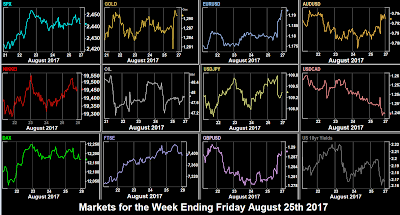 Many instruments (Gold, NKY, JPY, FTSE, US10Y) performed a re-run of Tuesday and Oil which did a re-run of Monday. News releases were light, and there were no black swans. SPX, DAX and FTSE rallied slightly, but the former pair finished flat and FTSE was only slightly up as UK GDP came in (1.7%) as expected at 0830. Currencies were mixed, CAD and GBP were up, EUR and AUD were flat. This is not to say that USD was weak, as JPY and Gold were down and yields were up. Oil gave up 1.6% which is quite mild by this most volatile of instruments’ standards. 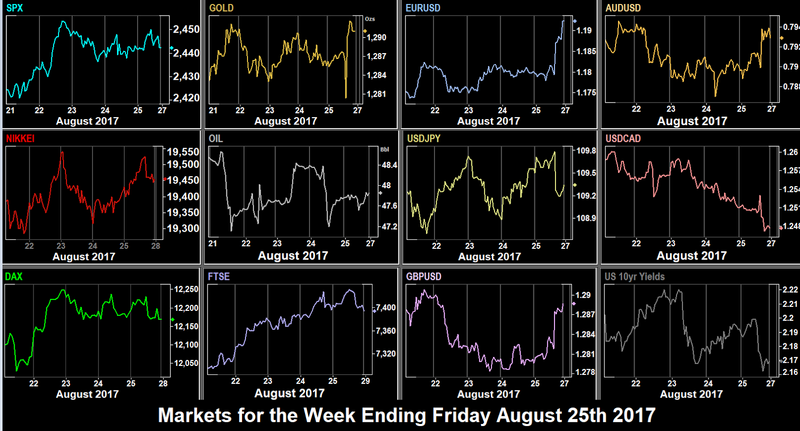 Friday was the big day, with speeches by Janet Yellen at 1400 and Mario Draghi at 1900, and fifth day of sentiment reversal! Even though neither speech contained any direct references to currencies, as we have said before it was what they didn’t say. Yellen didn’t say anything hawkish, and USD promptly fell 60 pips against JPY, 80 pips against EUR, and 70 pips against GBP, which doesn’t normally benefit from these dollar flights. Five hours later, Draghi didn’t say anything dovish and EUR put on a further 60 pips, to break through $1.19, its highest level since January 2015. It was an across the board rout for USD, Gold was also up (after a strong but momentary spike down) and yields were down. Indices were less volatile that earlier in the week, and generally ended flat. In summary, a most unusual week where we saw USD sentiment reverse every single day. The weekly movement figures below belie the actual volatility seen in the week. The final week of August ends the summer holiday season, and once again it is NFP week as Sep 1 falls on a Friday. There are several forwarding looking indicators released this week. Monday is a public holiday in the UK only, which has implications for forex flow, as London is the world’s main forex centre. FTSE futures will be traded as normal, as will the ADRs of the majors (BT, HBSC, Barclays) in New York. There is little scheduled news, but in politics Reichskanzlser Merkel meets her the Spanish, Italian and French leaders in Paris. Tuesday has some forward looking indicators, Consumer Confidence in Germany and the US, and Home Prices in the latter. (All housing statistics are taken as forward looking). President Trump meets his counterpart from Finland. Wednesday may see a major speech on tax reform, says White House Economic Advisor Gary Cohn (who is still there!). UK PM May flies to Japan. Topics may include Brexit and North Korea. The major news item of the day is US GDP, although the ADP jobs print is always interesting as a preview to NFP. The estimate is the same as last month’s actual at 178k. Note the normal low volatility German inflation figure which may provide a clue to the next day’s more important Eurozone figure. On Thursday, Europe is in the forefront with German Retail Sales and Unemployment, and Eurozone Unemployment and CPI. The euro is an extreme high again. Poor figures could trigger a pullback. Friday is NFP day. The estimate, at 185K is slightly higher than ADP, but well within historical norms. If the print is close to the estimate, traders will be looking at the ancillary reports: Unemployment, Average Weekly Hours. Average Hourly Earnings, and Labor Force Participation Rate in that order. Also important is the ISM Manufacturing PMI, which comes after several countries Markit reports in the same area. An exceptional item is the US Bank Stress Test Info, released 30 minutes before the market closes.